240 pages | 10 B/W Illus. The financial crisis that started in 2007 is a concern for the world. Some countries are in depression and governments are desperately trying to find solutions. In the absence of thorough debate on the emotions of money, bitter disputes, hatred and ‘moralizing’ can be misunderstood. 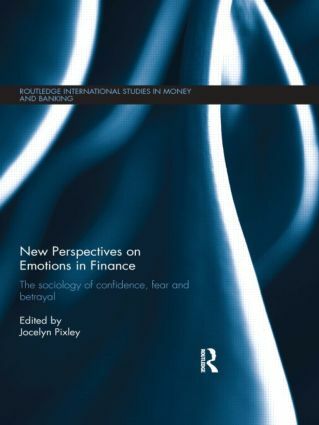 New Perspectives on Emotions in Finance carefully considers emotions often left unacknowledged, in order to explain the socially useful versus de-civilising, destructive, nature of money. This book offers an understanding of money that includes the possible civilising sentiments. This interdisciplinary volume examines what is seemingly an uncontrollable, fragile world of finance and explains the ‘panics’ of traders and ‘immoral panics’ in banking, ‘confidence’ of government and commercial decision makers, ‘shame’ or ‘cynicism’ of investors and asymmetries of ‘impersonal trust’ between finance corporations and their many publics. Money is shown to rely on this abstract trust or ‘faith’, but such motivations are in crisis with ‘angry’ conflicts over the ‘power of disposition’. Restraining influences – on ‘uncivilised emotions’ and rule breaking – need democratic consensus, due to enduring national differences in economic ‘sentiments’ even in ostensibly similar countries. Promising ideas for global reform are assessed from these cautionary interpretations. Instead of one ‘correct’ vision, sociologists in this book argue that corporations and global dependencies are driven by fears and normless sentiments which foster betrayal. This book is not about individuals, but habitus and market crudities. Human ‘nature’ or ‘greed’ cannot describe banks, which do not ‘feel’ because their motivations are not from personal psyches but organisational pressures, and are liable to switch under money’s inevitable uncertainties. This more inclusive social science studies emotions as a crucial factor among others, to expand the informed public debate among policy makers, bankers, academics, students and the public. Jocelyn Pixley is Professorial Research Fellow at the Global Policy Institute, London Metropolitan University, UK and is also Senior Visiting Fellow at the Industrial Relations Research Centre, University of New South Wales, Australia.